Classified » Business & Office » Businesses for Sale » Get Homogeneous Vinyl Flooring Solutions From Alaqsa Carpets. GET HOMOGENEOUS VINYL FLOORING SOLUTIONS FROM ALAQSA CARPETS. Alaqsa Carpets homogeneous sheet flooring offers a spectrum of colours that provide a clean, fresh appearance; assist in way finding; and create comfortable, engaging spaces. 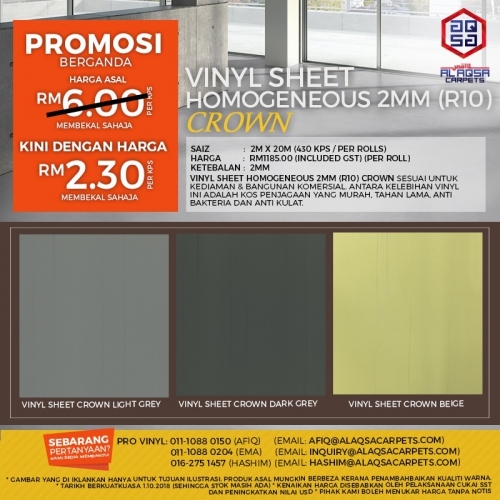 Homogeneous vinyl is made of 1 single layer that offers vibrancy and depth of colour. It is incredibly durable and stain resistant which makes it a great flooring choice for heavy traffic areas. Alaqsa Carpets presents its new homogeneous sheet flooring which is produced with the latest technology and offers striking floor designs. •	Durability, low maintenance and versatility.